In our binary options education series, we have explored the area of technical analysis or charting quite extensively. In today’s article, we will be looking at identifying consolidation areas, which are basically areas of market indecision where prices are consolidating; typically right after sharp price movements as markets ‘absorb’ the information that caused the price movement in the first place. A consolidation area is also part of a continuation pattern; the price movement before the consolidation area and after the consolidation area will tend to move in the same direction. 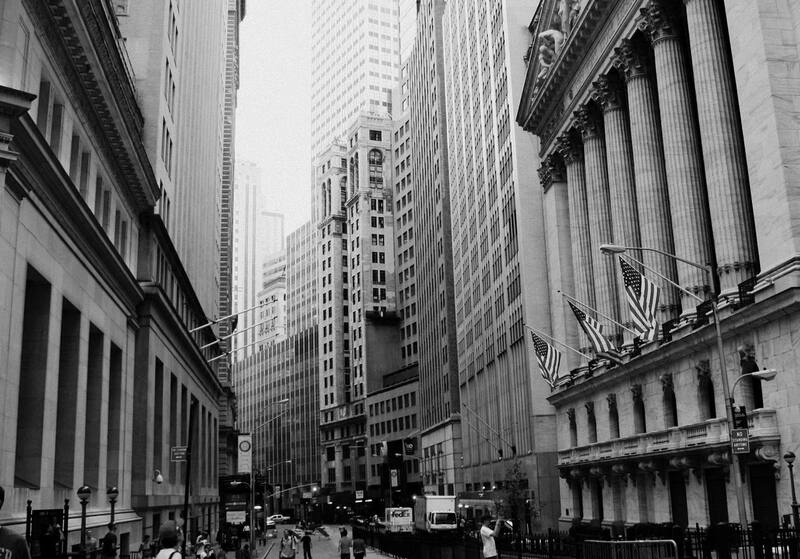 Obviously, being able to identify such areas would be a great trading advantage. 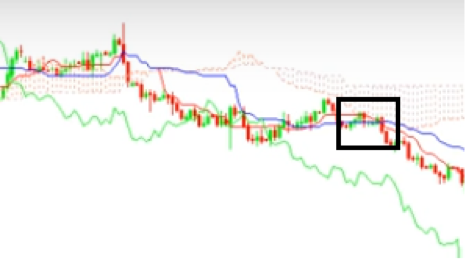 We will be looking at 2 strategies for identifying consolidation areas today: the Ichimoku Kinko Hyo and the Head and Shoulders consolidation pattern. 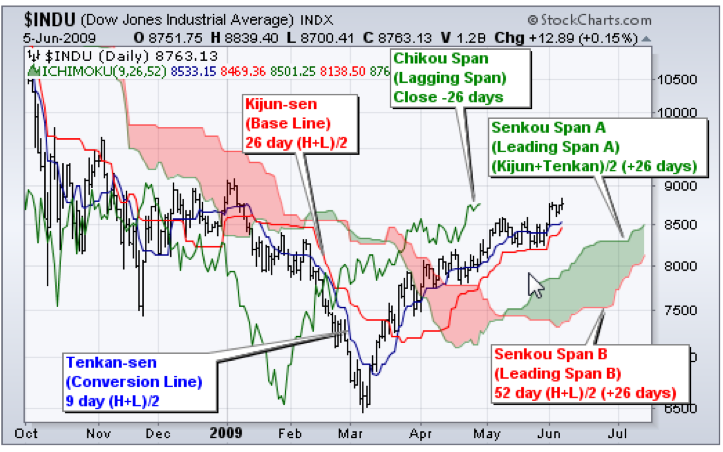 Conversion Line – The Tenkan-sen is calculated by the average of an asset’s 9-period high and 9-period low. Base Line – The Kinjan-sen is calculated by the average of an asset’s 26-period high and 26-period low. Leading Span A – The Senkou Span A is the midpoint between the conversion and baseline. It also forms one of the boundaries of the Ichimoku Cloud and is plotted 26 periods in the future. 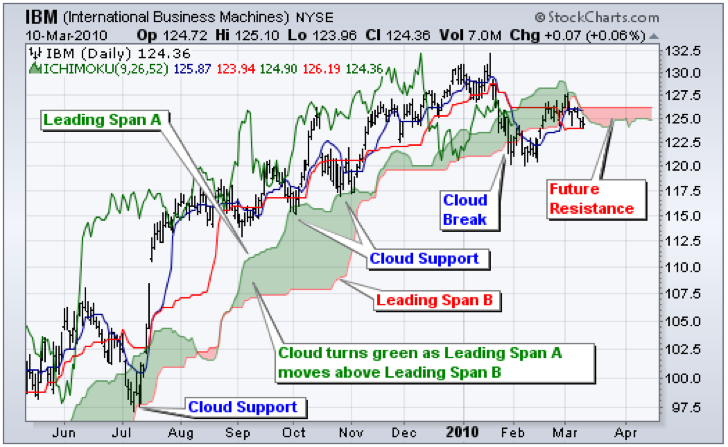 Leading Span B – The Senkou Span B is calculated by the average of an asset’s 52-period high and 52-period low; it is also one of the boundaries of the Ichimoku Cloud and is plotted 26 periods in the future. Lagging Span – The closing price of an asset plotted 26-periods in the past. 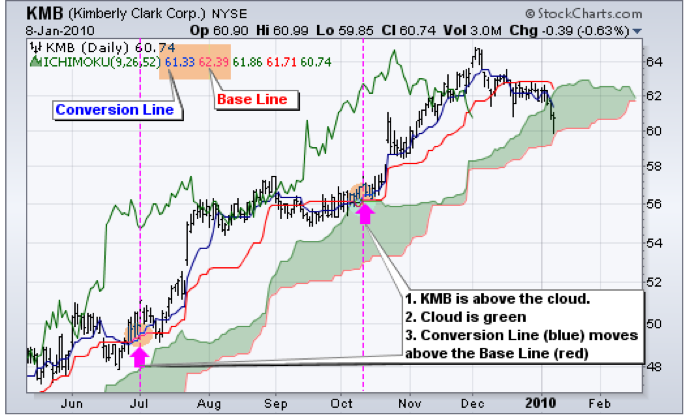 The graph above gives an example of an Ichimoku Kinko Hyo chart. Pay attention to the red and green shaded areas, those are the Ichimoku Clouds mentioned above. When the Leading Span A is above the Leading Span B, it is a green cloud and when the Leading Span B is above the Leading Span A, it is a red cloud. 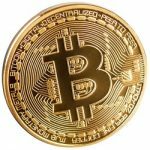 The cloud is the main tool used to analyze trends in this method; when prices are trading above the cloud, it is an uptrend and when prices are below the cloud, it is a downtrend. Because of this, the clouds themselves form a support or resistance level; look at the 2 examples below for indications of cloud support and resistance. In addition, because the boundaries of cloud are plotted in the future, when the cloud changes color it can be used as a sign of future resistance levels. 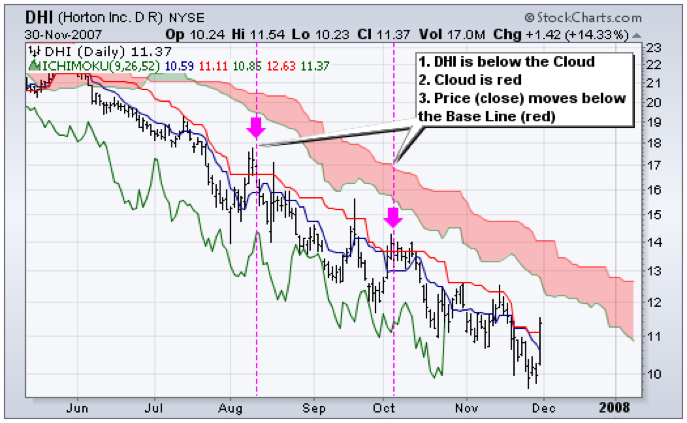 Within the larger uptrend or downward determined by whether prices are trading above or below the cloud, the relationship between the conversion line and baseline as well as the relationship between the price and the baseline can also act as smaller ‘signals’ within the larger trend. 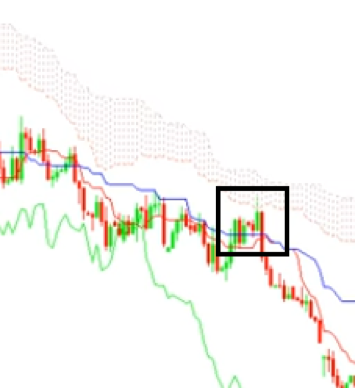 When the conversion line moves above the baseline within an uptrend (green cloud) or below the baseline in a downtrend (red cloud) those are examples of smaller bullish/bearish signals within an uptrend/downtrend. Also the price moving above or below the baseline during an uptrend/downtrend is another indicator of smaller bullish and bearish signals within their respective trends. 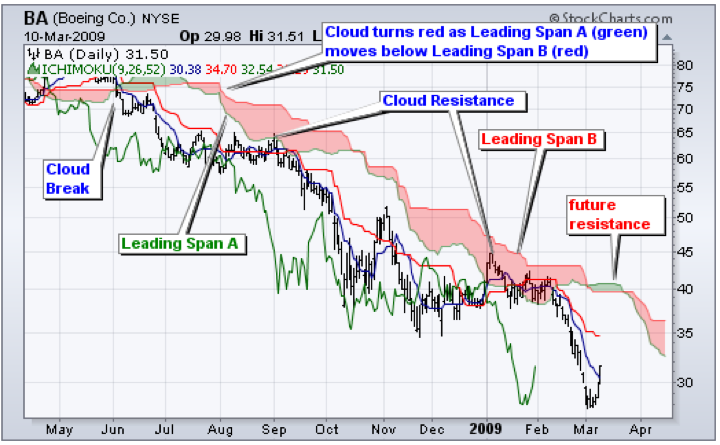 Notice the convergence of the price, cloud, conversion line and base line which form a consolidation area. 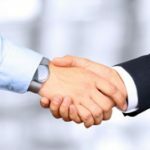 Next question is how do we know when the consolidation period is over? Look at the area to the right of the highlighted rectangles in the examples above: see how there are candles that fall below the conversion line without touching it? That’s a sign the consolidation period is over and also represents a trading opportunity. And since consolidation areas are continuation patterns; in the examples above since the preceding trend was a downtrend; the move here would be to place put options right after the consolidation area. Now, let’s talk about timeframes. Remember that charting is not 100% accurate and some patterns are weaker than others. As a general rule, the longer the timeframe of a consolidation area, the stronger a predictor it is. 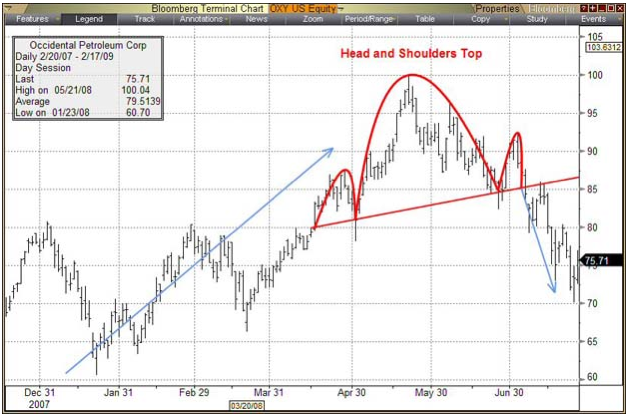 The first chart shows the traditional reversal Head and Shoulders pattern while the second shows the consolidation Head and Shoulders pattern. How do we tell the difference? We tell the difference by comparing the preceding trend to the Head and Shoulders pattern with the shape of the Head and Shoulders pattern itself. In a typical reversal Head and Shoulders pattern, an uptrend will be succeeded by a Head and Shoulders Top pattern (as seen in the first chart) and a downtrend will be succeeded by a Head and Shoulder Bottom or Inverse Head and Shoulders pattern. 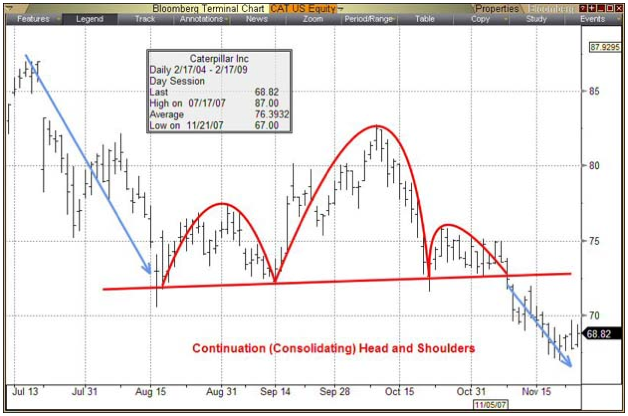 Conversely, take a look at the rarer consolidation Head and Shoulders Pattern; the preceding downtrend is followed by a Head and Shoulders Top pattern, indicating a continuation or consolidation, instead of an Inverse Head and Shoulders, which would typify the regular reversal Head and Shoulders.